Lots of stuff has gone on since my last posting. First I competed in the Summer Games Triathlon. I did not train for the swimming and running and I really did not want to do it but I did and I got my best time ever. I finished in 1 hr 36 min. Yea! I got seventh in my age group and 20th over all. So next time I will train and maybe I will get a medal (maybe). The Tri was on G's birthday so when I got home fun was to be had. We went to Denny's (G's favorite and luckily kids eat free on Sat.) and then we went to Brenda's and had a family birthday party. 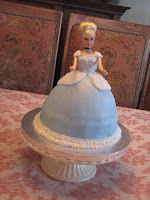 Aunt Brenda made G the prettiest Cinderella cake ever!! 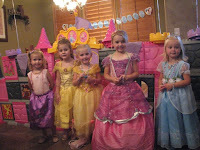 Then on Monday we had her friend birthday and of course it was a princess party. 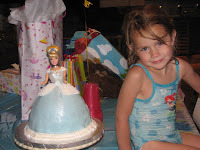 We made crowns and then played princess games and had cupcakes but the Cinderella cake was the talk of the town. 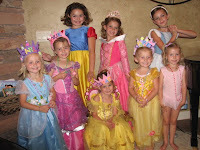 We even had real princesses show up for games and pictures. In between the parties of course it was Father's Day. The kids had a good time putting Joe on a treasure hunt after church to find all his goodies. At the end, he found his new phone that finally puts him back into the new information age! We spent the rest of the day with dad and Grandpa Lynn. Joe is an amazing husband and dad. He does everything right! He makes the family whole and everyone he comes in contact with remembers him in a Christ like manner. We are so proud of him in all he does and we love him with all our hearts!! In the midst of all the others things I got to plan Girl's Camp 08. This is my 8th year going and I don't see it ending any time soon. I love it though. I have a deep love for the young women in our ward and enjoy being their leader and friend. The ward clerks made sure this year that I knew that I am one of two of the biggest budget spenders. So I told them to release me. 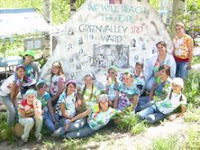 T don't think it will happen so when camp comes around next year I will spend away making sure the girl's are feed well both temporally and spiritually! Beautifully Created Rock Solid was our theme and K2 was our given mountain. I built a huge mountain and put all of the girls pictures on the mountain. Thanks to Malea we got the award for the best modeling pictures / decorations. I had a wonderful time and I always grow so much at camp and learn so much from the girl's. Till next year! June has been a busy month and now that I am done my summer begins!! 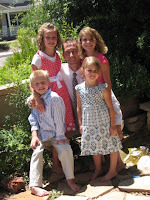 I am cleaning house and enjoying my kids while they are home.